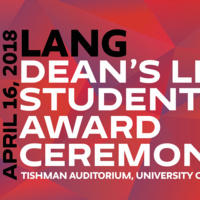 Each year, the Eugene Lang College community gathers to celebrate our thoughtful, dedicated, and engaged students. We recognize high-achieving, academically rigorous students as well as their unique and groundbreaking work, from nesting oysters in the Hudson to learning Khmer in Cambodia. 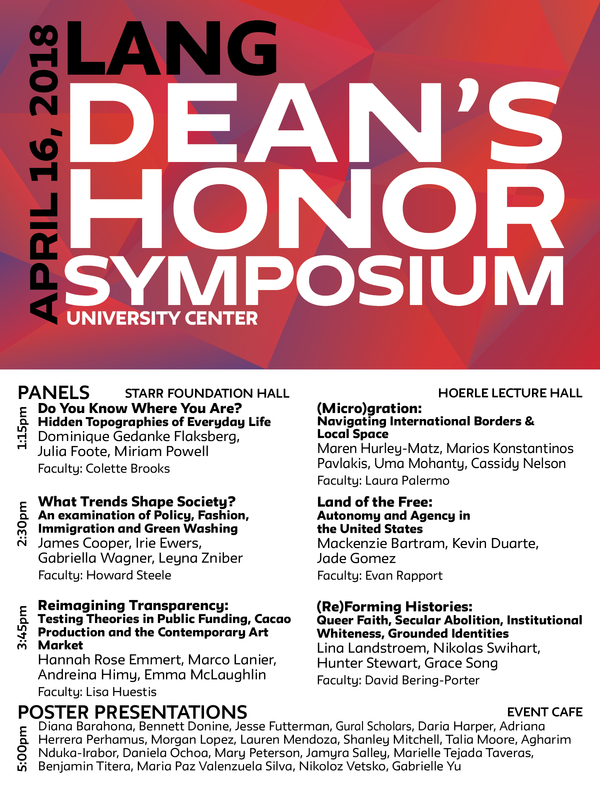 The Lang College Dean’s Honor Symposium is a conference for students to present their academic work and co-curricular projects to the Lang community. Participating students applied to present their work in the fall semester. The work shows a range of academic disciplines and inter-disciplines; furthermore, many explore critical histories as well as contemporary social issues because at Lang, social justice is at the core of our liberal arts education. Projects range from rigorous academic writing, to civic engagement and social justice work, to creative projects, to exemplary work outside of Lang such as through internships or work experiences.